Hello and welcome back to my daily blog-spamming! It occurred to me that I haven't talked a lot about the actual game we made during the project, except for the short introduction that I gave in this post. In short, Slumber is a game that is supposed to help the player sleep. It's intended to be played on a smartphone or a tablet, in bed, before going to sleep. In my last post I promised to explain what a nudibranch is and why we are making a game about it! Nudibranch means "naked gills", and they are a kind of sea slug that can be found in almost any ocean. They all have exposed gills, which is the rosette-like thing you can see on their back. Some of them eat poisonous sponges and collect the poison inside themselves, which renders them quite untasty for predators. They come in a lot of amazing colours and patterns - the picture below is from here, where you also can read a bit more about these adorable and crazy creatures. So why a nudibranch? When I was thinking about the setting of the game I figured being underwater and exploring might be one of the most relaxing things out there, and that works well with a game that is supposed to help you sleep. 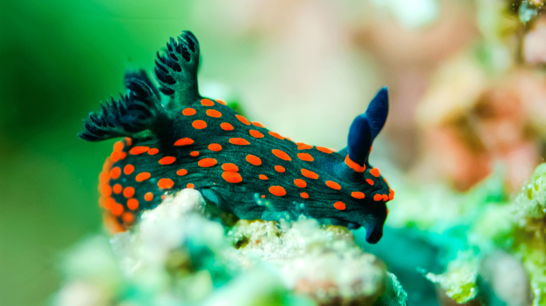 The nudibranch got chosen simply because it's so darn cute, and also more people should know about it! Avoiding the colour blue. As it is becoming increasingly common to interact with phones and tablets before going to bed, we wanted to design a game for those platforms that did not share the same problems that other games might have. One of the biggest problems with interacting with screens before going to bed is the light that the screens emit, which prevents the player from feeling more sleepy. This is especially true of blue light, which is the most effective at stopping the production of sleep hormones in your body, preventing you from feeling sleepy. Therefore Slumber is designed with a reddish colour scheme, which is on the opposite side of the spectra from blue. No stress. No time-limits, nothing to make the player feel like they have to play for another 30 minutes in order to gather those points they need to reach a certain goal. Our goal is to make the player feel like they could leave the game at any time in order to go to sleep, without losing progress. Balance between engagement and relaxation. This is a tough one. Allthough we want to provide a safe and calming environment for the player, they also need to not be bored by the game because then why would anyone play it? We solved it by adding a system for befriending fish, which is done through giving them food. The player then has to collect algae around the world which they can use to feed the fish. This provides an extra goal for the player, who now get to explore AND look for fish food, as well as create an even more friendly environment because you're surrounded by potential friends. Reward sleeping. Slumber will detect when you fall asleep, and when you sleep you will gather "sleep energy". This energy is then used to create content in the game that you can explore the night after, giving you new things to explore and play with. This is also meant to provide an opportunity for the player to create better sleep routines by continously coming back to play Slumber before going to bed.